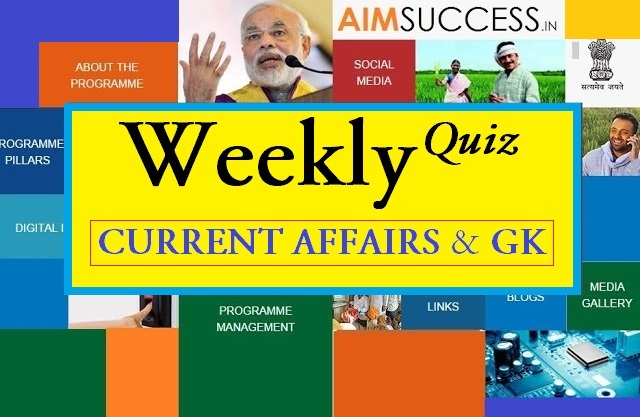 The Weekly Current Affairs Quiz (06th to 12th) November 2017 cover topics including Hockey Asia Cup 2017, COP-23 and Deen Dayal SPARSH Yojana among others. 1. India is going to jointly work on a multi-radio telescope project with which nation? 2. Which team won the women’s Hockey Asia Cup 2017? 3. The 23rd annual conference of the parties (COP) was held in which country? 4. Who has been appointed as the new Finance Secretary? 5. India has pledged to contribute how much amount to UN partnership fund? 6. India has test-fired a homegrown subsonic cruise missile. What is it called? 7. The Union government launched Deen Dayal SPARSH Yojana to benefit whom? 8. Who has been honoured with the 2017 Vishnudas Bhave award? 9. Which country has unveiled Asia’s largest island building vessel? 10. The European Union has launched an Election Observation Mission for which country’s polls? 11. Which nation has launched a earth observation satellite? 12. Who has won the men’s singles event at the 82nd Senior National Championship? 13. Which social media giant has brought disaster response tools to India? 14. Which Indian has been honoured with the 'Entrepreneur of the Year Award 2017'? 15. India has been re-elected as the member of which UN body’s executive board? India and South would be jointly expanding their efforts in tracing the evolution of galaxies thereby, further strengthening their 20 years of strategic partnership. India would be participating in the multi-nation Square Kilometre Array (SKA) - a large multi radio telescope project aimed to be built in Australia, New Zealand, and South Africa, where the view of the Milky Way Galaxy is best and radio interference least. The Indian women's hockey team beat China 5-4 to lift the Asia Cup 2017 title, securing a berth for itself at the 2018 Hockey World Cup. This is the second time that India has claimed the top spot in the history of the tournament. The first time was 13 years ago in the year 2004. The 23rd annual conference of the parties (COP) under the UN Framework Convention on Climate Change (UNFCCC) kicked off in Bonn, Germany on 6 November 2017 with the aim to hold to the path of the Paris Climate Change Agreement. The Appointments Committee of the Cabinet on 6 November 2017 approved the appointment of revenue secretary Hasmukh Adhia as the new Finance Secretary of the country. Adhia would be succeeding Ashok Lavasa, who announced his retirement last month. India has pledged an additional USD 100 million towards the UN partnership fund, significantly scaling up its support to sustainable development projects across the developing world. The India-UN Development Partnership Fund was set up earlier this year as a partnership between India and the United Nations Office for South-South Cooperation. India on 7 November 2017 conducted a flight test of its indigenously designed and developed long range sub-sonic cruise missile 'Nirbhay', which can carry warheads of up to 300 kg, from a test range at Chandipur along the Odisha coast. This was the fifth experimental test of the homegrown missile system. Minister of Communications Manoj Sinha on 3 November 2017 launched a Pan India scholarship program for school children called Deen Dayal SPARSH Yojana to increase the reach of Philately. Under the scheme, it is proposed to award annual scholarships to children studying in class 6-9, having good academic record and also pursuing Philately as a hobby through a competitive selection process in all postal circles. Renowned Indian film and television actor Mohan Joshi was honoured with the prestigious Vishnudas Bhave award for his contribution to the theatre on 5 November 2017. The award was presented to Joshi by veteran actor Jayant Sawarkar. The award is conferred in memory of Vishnudas Bhave, the founder of Marathi theatre. It comprises a trophy, a citation and a cash prize worth Rs 25,000. China on 3 November 2017 launched a massive ship, which is being referred as Asia's largest dredging vessel, at a port in eastern Jiangsu province. The vessel described as a ‘magic island maker’ is capable of building artificial islands. The European Union on 7 November 2017 launched an Election Observation Mission (EU EOM) for the upcoming parliament and provincial elections in Nepal. The Chief Observer and a member of the European Parliament from Croatia, Zeljana Zovko said that it is a great privilege to have been given this opportunity to lead the mission. The elections mark an important stage in Nepal's democratic development. Morocco on 7 November 2017 successfully launched an earth observation satellite called “Mohammed VI-A”. The satellite was launched by European consortium Arianespace's Vega rocket from French Guyana Space Centre. The Mohammed VI-A satellite is an Earth observation satellite built for Morocco by Thales Alenia Space as prime contractor and Airbus as co-prime. H S Prannoy beat World No 2 and title favourite Kidambi Srikanth in the men’s singles final at the 82nd Senior National Championship, which was held in Nagpur, Maharashtra on 8 November 2017. The second-seeded Prannoy, who achieved his career-best ranking of World No 11 last week, got the better off top seeded Srikanth 21-15, 16-21, 21-7 in a 49-minute clash. Facebook has partnered with the National Disaster Management Authority (NDMA) and a non-profit body, SEEDS in India, to offer tools to these agencies to help them respond more effectively to natural disasters. The US-based firm will offer disaster maps data that illustrate aspects like peoples movement and concentration of Facebook users in the given area before and after a calamity. ASSOCHAM, (Associated Chambers of Commerce and Industry of India) honoured CMC Skills' Founder Maya Swaminathan Sinha with the 'Entrepreneur of the Year Award 2017' in Ranchi. The award was presented by Governor of Jharkhand, Draupadi Murmu. India was re-elected as the member of UNESCO’s executive board on 9 November 2017.The election was held at the 39th session of the General Conference of the United Nations Educational, Scientific and Cultural Organisation in Paris. The executive board is the top decision- making body of the international organisation.